In the article below, we analyze the surprisingly likely drivers that may keep the US dollar strengthening over the next few years, especially if another economic/financial crisis arrives. While there are many reasons to fear for the longer term viability of the US dollar given America’s current misguided monetary policy and exponentially increasing debt & liabilities, the next few years could well see the greenback appreciate further by 50-100% relative to the world’s other major fiat currencies. I have long been a dollar bull, not for any over-arching reasons based on inflation, deflation, rising geopolitical multi-polarity or any of the other issues that touch on the dollar’s valuation vis-à-vis other currencies. My analysis focuses on a few basics: the dollar’s status as the global reserve currency, Triffin’s Paradox (a.k.a. Triffin’s Dilemma) and global capital flows into the dollar and dollar-denominated assets such as U.S. Treasury bonds. When we say the U.S. dollar is the global reserve currency, what does that mean? There is often some confusion about the difference between a trading currency and a reserve currency. Let’s use an example to explain the difference. Country A trades $10 billion of goods and services with Country B, which does $10.01 billion of trade with Country A. The two nations agree to a trade pact that enables the two nations to trade currencies directly, that is, without converting the payments for trade into a third currency such as the dollar. Once the bilateral trade is settled, a modest $10 million remains as a surplus/trade deficit. The owner of the surplus (Country B, in this example) can trade that excess currency on the global foreign exchange (FX) market, use it to buy goods or services, or hold it. The modest $10 million is a tiny slice of the two trading nations’ money stock and gross domestic products (GDP), and it has little effect on either global or domestic finance. The $10 million is a small claim against the currency of the nation running the trade deficit (Country A, in this case). The main takeaway is that billions of dollars of trade transactions may yield very little surplus/deficit. Trading currencies are examples of the transactional nature of money: money enables transactions. A reserve currency, on the other hand, is an example of money as a store of value: nations hold reserve currencies as stores of value that can be sold to support their own currency if the need arises. 3. Its value is set by supply and demand – i.e. capital flows and market forces, rather than an arbitrary peg. Many observers greet the announcement of recent bilateral or multi-lateral currency agreements as evidence the U.S. dollar is weakening. But this is mixing apples and oranges: the U.S. doesn’t gain much by issuing a currency that serves transactional needs — it offers no profit to the U.S. if trade between other nations is conducted in yen, renminbi, euros or quatloos. The demand for transactional currency is temporary. Transact the trade, and then the cash moves on to the next transaction. The demand for reserve currency is not transactional. A nation that wants to build reserves must acquire the reserve currency and hold it. Nations that issue reserve currencies must issue enough of their currency to satisfy the global demand for reserves, and the only way to do this is run substantial *and* permanent trade deficits. Why do countries need reserves in the first place? The answer can get complicated, but the basic dynamic is supply and demand: if Nation A prints vast quantities of its own currency (let’s call it the quatloo) and uses the cash to buy goods and services without creating an equivalent amount of goods and services to sell to other nations, it will run a large trade deficit. The supply of quatloos will soon exceed the demand: everybody who accepted freshly printed quatloos for their exports wants to trade them for goods or unload them as soon as possible. As a result, the value of quatloos on the global FX market falls, and Nation A is in danger of plunging into a currency crisis: as the value of the quatloo declines, the price of imports rises within Nation A, and soon people can no longer afford imports from other nations—for example, grain and oil. One way Nation A can support the value of its quatloos is to sell its reserve currency and use the cash to buy quatloos, soaking up the excess supply that is depressing the quatloo’s value. So currency reserves act as a stabilizing anchor for the nation’s own currency. There is another often-overlooked role for currency reserves: they act as the asset base for the expansion of credit within the domestic economy. A central bank with substantial reserves can issue credit in the domestic currency commensurate with its holdings of assets such as gold or currency reserves. There are number of reasons why nations might choose to buy or sell U.S. dollars, or assets denominated in dollars such as Treasury bonds. 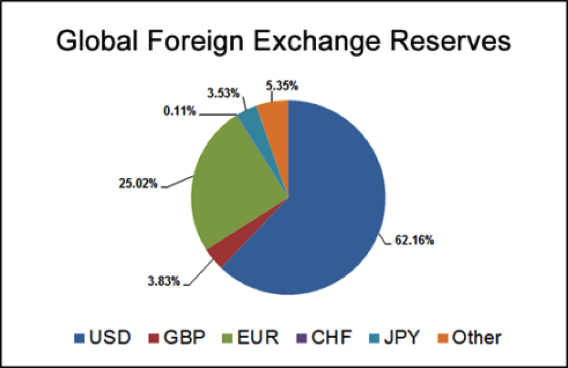 Let’s start by noting that the dollar is not the only reserve currency; the USD is roughly 62% of global currency reserves, the euro is about 25% and other currencies make up the balance. Nations might sell dollars and buy another reserve currency to diversify their holdings, hedge against a decline in the dollar relative to other reserve currencies, or perhaps as a form of geopolitical weapon or protest against American hegemony or specific policies. 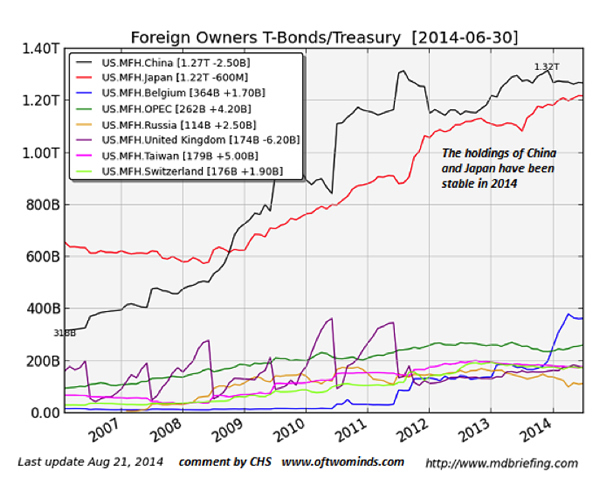 The discussion of major foreign holders of Treasury Securities, i.e. foreign states and central banks, often overlooks one key driver of this trade: states seeking to weaken their own currency to boost their exports sell their own currency and buy U.S. dollars (or dollar-denominated assets such as Treasuries). This increases the supply of their own currency, pushing the value lower, while the increased demand for dollars pushes the value of USD higher. 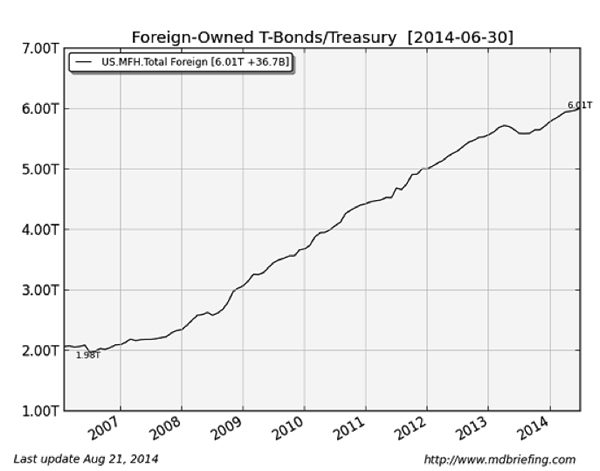 In terms of foreign trade, this weakens the currency of the buyer of Treasuries in relation to the dollar. In other words, major holders of U.S. Treasuries such as China and Japan have an over-riding incentive to keep buying Treasuries: buying dollars stabilizes or weakens their currency vis-a-vis the U.S. dollar, making their goods and services cheaper in the U.S. and thereby boosting their exports. There are two other reasons nations might buy dollars: the dollar is available in size, unlike smaller currencies such as the Swiss franc, and it is widely viewed as a proxy of U.S. economic, military and diplomatic stability: in other words, in periods of crisis, the dollar is widely viewed as a safe haven currency. We now have a basic understanding of the forces of supply and demand for the dollar as a reserve currency: nations buy dollars as reserves, and also to weaken or stabilize the value of their own currency against the dollar, a strategy designed to boost their exports to the U.S.
On the supply side, the U.S. issues a surplus of dollars for others to use as reserves by running a trade deficit. Should that deficit shrink, the supply of dollars will also shrink. In Part 2: Why The US Dollar Could Strengthen – A Lot From Here we analyze the surprisingly likely drivers that may keep the US dollar strengthening over the next few years, especially if another economic/financial crisis arrives. While there are many reasons to fear for the longer term viability of the US dollar given America’s current misguided monetary policy and exponentially increasing debt & liabilities, the next few years could well see it appreciate further by 50-100% relative to the world’s other major fiat currencies. For those understandably disgusted by the reckless expansion of the US money supply over the past six years, it’s vitally important to remember that the road to our monetary endgame is not a straight line, nor necessarily intuitive. To have the best chance of remaining solvent, understanding the likeliest pathways the route will take is often nearly as important as correctly predicting the final destination.